356 Porsches were NOT designed for air conditioning! 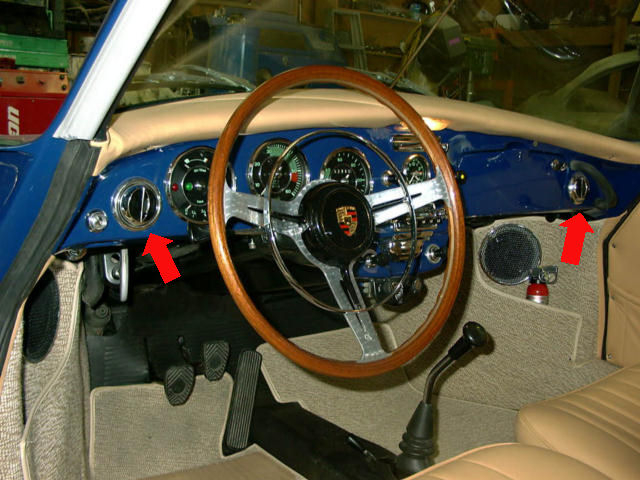 Below are images and some commentary about the installation of air conditioning systems in 356 Porsches back when these cars were new and air conditioning was just becoming a regular accessary for normal passenger cars. Most of the images come from the Installation Instructions for the Delanair brand of air conditioning systems that were installed in 356 Porsches and distributed by Porsche of American Corporation to Porsche dealers. These instructions show the step by step procedures with images necessary to properly install a Delanair A/C unit in a 356 Porsche. After reading these instructions and seeing the images, it becomes clear that 356 Porsches were not designed with A/C in mind, and retrofitting 356's to accomodate this complicated accessory required a lot of work and a lot of modifications to the car. The following two images graphically show the three large holes that must be cut and drilled into the wall between the interior of the car and the front trunk compartment. A/C parts installed here, primarily the Evaporator, will necessitate eliminating or moving certain stock parts like the window washer tank and the drain catch and hose for the fresh air vent. Care was necessary to preclude damaging other parts under the dash including the radio, glovebox, and windshield wiper assembly. Drilling the holes for the cold air ducts to go in under the dash. Car is a 356-B T-6. Square hole on left to pull air out of the cabin, round holes for cold air into the cabin. Below is the Evaporator Group that is mounted in the front trunk area. A blower fan pulls the warm air from the cabin, and pushes it over the Evaporator coils which cool the air. The cool air is then blown back into the cabin through ducting routed thru the two round holes. Certain parts had to be eliminated or relocated to accomodate this installation. In addition, the installation reduced the storage capacity of the front trunk area, as can be more graphically seen in a picture shown later in this article. In the image below, you can see that the window washer tank has been moved in front of the fuse box. Above the black fan motor is sticking out the end of the Evaporator Group Housing (A). To the right, you can see the remounted window washer tank in front of the fuse box. Below is the factory tool kit. Delanair (Porscheair) unit in a 356-B T-6. In the above image, it shows that the Evaporator Group Housing takes up lots of space in the trunk area. 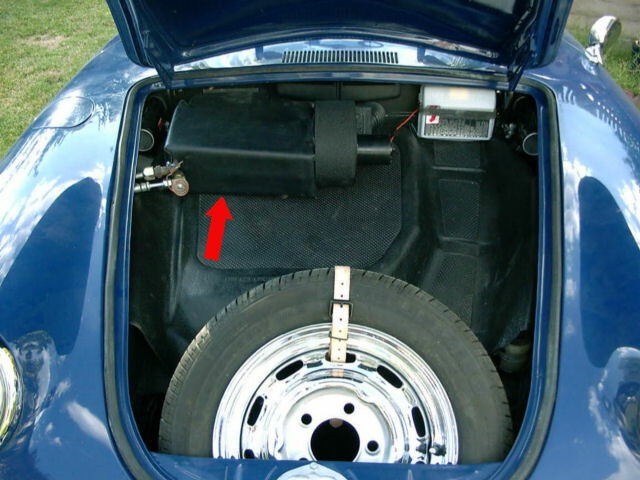 The image below shows the inside of the upper back portion of the passenger side fender well on a 356-B T-6 where the gas tank filler pipe comes out of the trunk compartment into the fender well and exits out the top of the fender. It's quite a jumble of hoses going to and from the various parts of the air conditioner. Figure A is the gas tank filler pipe going down into the gas tank. Figure B shows where a large hole has to be cut into the side of the front trunk for the two lines that go to the Evaporator Grouup in the trunk. The hole is approximately 3 inches by 1.5 inches. Screw holes are also necessary to hold the any A/C lines in place. Now let's look under the driver's side front fender. What we see here is one of two Condensers. Both are located forward of the fender brace and below the headlight bucket on both sides of the car. They are linked to the rest of the air conditioning system by a bunch of thick rubber hoses for which lots of holes have to be drilled in your 356! The Condenser takes advantage of the cool air that comes through the small vent next to the front turn signal lights. This is sort of a jury-rigged arrangement. The area where the Condensers are mounted was not designed for an air conditioning condenser. I wonder if this arrangement precludes mounting the factory fog lights? Above you can see the finned condenser coils. No lines are hooked up in this picture! Up under the back part of the rear fender well. Up under the forward part of the rear fender well. The three lines pictured above in the rear fender are: (1) the output line from the Compressor to the two Condensers in the front of the car, (2) the output line from the Receiver/Dryer to the Evaporator, and (3) the return line from the Evaporator to the Compressor. That's a lot of hoses! See the schematic diagram of the system below. According to the instruction sheet, this A/C assembly requires 70 feet of hose! To the Back of the Car! Now lets go to the back of the car where we will find the Compressor and the Dryer in the engine compartment, and the Rear Condenser fitted inside the rear deck lid. Since this is where cool air comes into engine compartment, the Rear Condensor has the effect of reducing the cooling efficiency of the engine. This 3rd Condenser is mounted inside the rear deck lid. Lets see what the engine compartment looks like! The components that are placed in the engine compartment include the Compressor, the Receiver/Dryer and the relevent hoses and connectors. The Compressor requires substantial additional mounting hardware that can be seen in the images below, and takes its power off the crankshaft like the generator with a fan belt. A crowded engine compartment becomes even more so! Image shows the Compressor and Receiver/Dryer. The four primary parts of any air conditioning system are: the Compressor, the Condenser(s), the Receiver/Dryer, and the Evaporator. Other parts include fans, metering devices, switches, wiring, mounting hardware, hoses, and fittings, to name a few. Below are a few comments on the basics of air conditioning and the refrigerant cycle. The following is a schematic showing the flow of the refrigerant during one complete cycle. The cycle involves essentially three steps: pressurization, condensation, and vaporization. "The refrigerant enters the Compressor through the suction port as a low-pressure vapor. After squeezing this vapor into a confined area (pressurization), it is released through the Compressor's discharge port. By pressurizing the refrigerant, the Compressor causes the refrigerant vapor to become much hotter than the outside air. This ensures that it will change to a liquid as the cycle enters the next phase." "Once pressurized, the Compressor pumps the (hot) high-pressure refrigerant vapor to the Condenser(s), which (is/are) located behind the grill in front.... As the outside air is drawn (thru) the Condenser(s).....the incoming air absorbs the heat contained in the high-pressure vapor. This causes the vapor to condense into a high pressure liquid, completing the second phase of the process (condensation)." "(After) the refirgerant leaves the Condenser(s), it makes its way toward the Evaporator, which is located within the air handling case along with the blower. Before entering the Evaporator, the refrigerant flows through a metering device. This results in a significant drop in pressure, allowing the refrigerant to vaporize at a lower temperature. This ensures that the refrigerant will absorb the maximum amount of heat as the blower forces warm air over the Evaporator coils. At this point, the vaporization phase is complete, and the heat laden vapor is drawn back into the Compressor so the cycle can be repeated." The vaporization of the refrigerant in the Evaporator removes the heat from the air and the blower sends the cooled air back into the car. Diagram showing Air Conditioning Cycle. Look at all the hoses that are involved! The flow goes from the Compressor in the back of the car, to the Left Condenser at the front of the car, to the Right Condenser at the front of the car, to the Rear Condenser in the rear deck lid, to the Dryer in the engine compartment, back to the front of the car to the Evaporator, and then back the the rear of the car to the Compressor in the engine compartment! That's a lot of hoses! How many connections do you think are involved? What about all the new holes required in your 356 to install them? 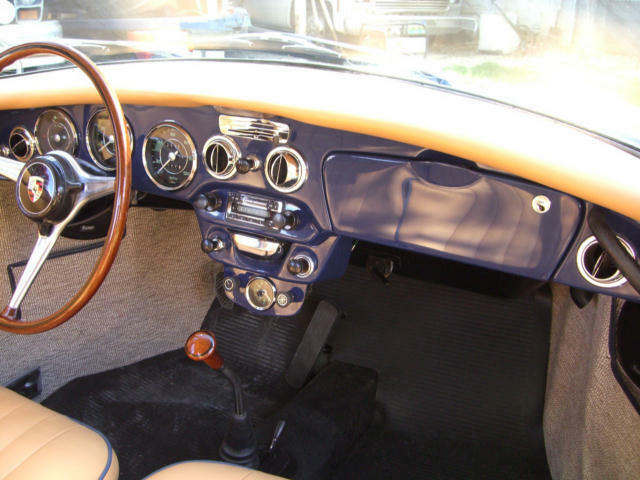 356 Porsches were not designed to accomodate Air Conditioning. The Delanair A/C Unit inside the Cabin. Delanair "PorscheAir" A/C installation in a Porsche 356-B T-6. Different set up bringing cold air into the cabin in a 356-C, A/C switches under ashtray. Shows Evaporator with fan in the trunk of a 356-C, no window washer bottle in sight! Different set up bringing cold air into the cabin in a 356-C. A/C switches under ashtray. on air conditioning for 356 Porsches. Dale's installation tag for his Artic-Kar A/C unit. use some of the newer hardware..."
If anyone has any pictures of an Artic-Kar A/C unit in a 356 Porsche, send them to me and I'll add them to this website. Thanks! A/C was never a factory installed accessory for 356 Porsches. However, beginning in about 1962, at least two companies began offering an air conditioning system for installaltion in 356 Porsches in the USA. Delanair, actually Delanair Engineering Co., Inc., is probably the best known. At some point Delanair became "Porschair" and was distributed to Porsche dealers by Porsche of America Corporation. Later in 1968 or 1969 Delanair was acquired by Volkswagen, and became Volkswagen Products Corp.
Another supplier of air conditioning units for 356 Porsches was Artic-Kar, as evidenced by the information provided above by Dale Moody. The Artic-Kar unit had the condenser mounted behind the spare tire with a fan to cool it. One of the big problems with all the early units was the 6-volt electrical systems. 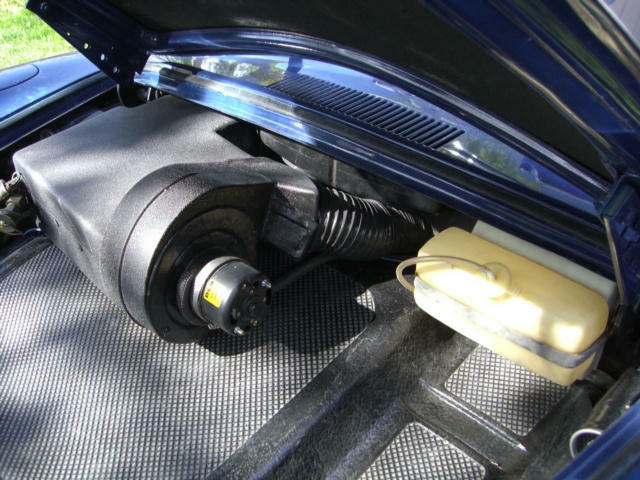 12-volt systems greatly improved the A/C systems' efficiency. In 1966 or 1967, a third company by the name of Coolaire introduced a line of A/C units for early 911's and 912's. In 1969, Porsche began acquiring A/C units from Behr GmbH & Co. KG, of Stuttgart. These units became the first to be "factory installed" into primarily 911's. Behr continues to supply air conditioning systems to Porsche to this day. This website was designed for educational purposes to document the history of advertising materials for 356 Porsches 1950-1965, and was created on 8/10/2007, and will be continuously updated with additional material. Come back and see! Updated 2/14/14. wishes them to be removed, they will be.